Jim Moroney is the chairman, president and CEO of A. H. Belo Corporation. He has held this position since September 2013. 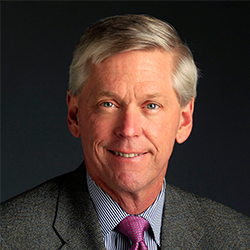 He served as CEO and publisher of The Dallas Morning News from 2001 to 2018. Jim served as president of Belo Interactive, Inc. from its formation in May 1999 until June 2001. Jim presently serves on the boards of The Associated Press, the News Media Alliance, The Dallas Foundation, for which he presently serves as the chair of the Board of Governors, the State Fair of Texas, the Advisory Board of the College of Communications at the University of Texas and the Bishop’s Finance Council of the Diocese of Dallas. In April 2004, Editor & Publisher selected Jim as Publisher of the Year for his accomplishments at The Dallas Morning News. In 2012, he served as chairman of the Newspaper Association of America, the industry’s trade association (now named News Media Alliance). In 2012, he received the Frank W. Mayborn Award from The Texas Daily Newspaper Association for Community Leadership. In 2016, he received the Frank W. Mayborn Leadership Award from the Southern Newspaper Publishers Association. In 2017, he received the James Madison Award from the Freedom of Information Foundation of Texas. Jim graduated from Stanford University in 1978 with a bachelor of arts in American studies. In 1983 he received his master of business administration from The University of Texas at Austin. Jim and his wife, Barbara Bass Moroney, have five children: Sean, Meagan, Kyle, and twins Callie and Jenny. Moroney was chair and presenter of the Keynote Panel: Newspapers in a post-advertising era at ISOJ 2018 on Friday, April 13 @8:45 a.m.